Decisions, decisions, decisions! That's how I felt when looking through the blog I was given for the Blogger's Choice Recipe Swap hosted by A Taste of Home Cooking. It took me a while to browse through all of the recipes on Cookaholic Wife and I kept changing my mind of which recipe I'd choose. I finally settled on a chicken and pasta recipe - Buffalo Chicken Pasta. I chose this because buffalo sauce isn't something I'd normally think of pairing with pasta. Before I get into the recipe, I have to share an embarrassing little story. I used to have such a good memory, but then I had my daughter and I don't know what has happened! I feel like I have lost some of that, and it's mostly short term memory. If I don't write it down, forget it, it's out of my head. My husband is constantly teasing me about my lists and yes, I make one for everything. So when I chose this recipe, I didn't remember that I had made it before in another swap just 5 months ago. It wasn't exactly the same recipe, but how could I not remember making pasta using buffalo sauce? It's not your most common combination of ingredients at all. I ate it and didn't remember that I already made it. It wasn't until I sat down to write this post that I remembered I already made something very similar... pretty bad, huh? But that does NOT reflect on the recipe, at all. I can't believe I couldn't remember this one! I loved the first version, and I loved this one! Nichole, thanks for sharing this one! Bring a large pot of lightly salted water to a boil. Cook pasta according to package directions. Drain and set aside. In a large skillet, heat the canola oil over medium heat. Add the onions, carrot and celery and cook for 5-7 minutes. Add the garlic and cook 1 minute more. Meanwhile, combine the flour and paprika together in a shallow dish. Dredge the chicken pieces through the mixture (I skipped this step and instead seasoned the chicken with salt, pepper, and paprika), then add the chicken to the skillet. Cook for 5-7 minutes or until the chicken is mostly cooked through, stirring frequently. Pour in the hot sauce, tomatoes and chicken broth and bring to a simmer. Simmer for 3 minutes or until slightly thickened. Stir in the butter until melted. 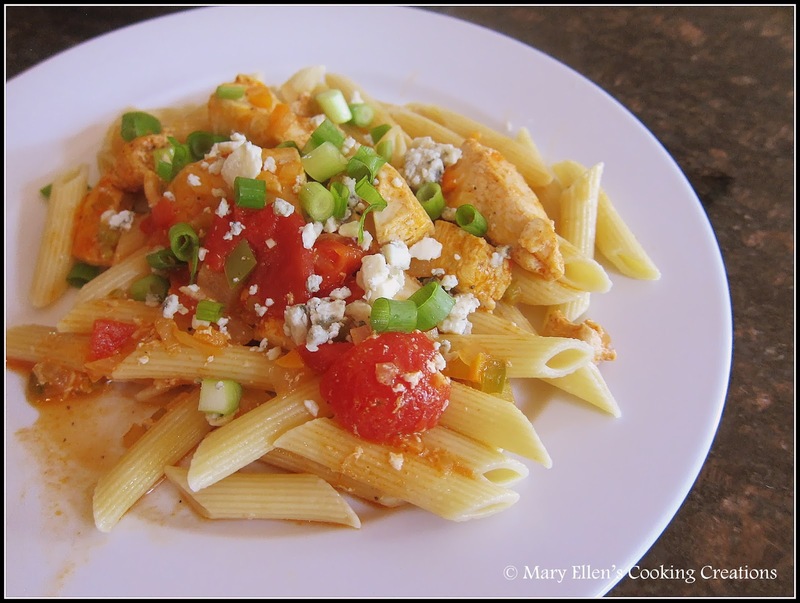 Divide the pasta among the dishes, top with the chicken mixture and then garnish with the blue cheese crumbles and green onions. We love buffalo and your pasta sounds great. How funny you made it before... it must have been just as delicious the second time around. Too funny that you'd made something similar before. :) Glad you liked it both times. Yum! What a cool twist on an old favorite! That's funny that you didn't remember but that's totally something I would do! Either way-this looks great! This looks great, I love buffalo on almost anything! I don't even have the kid excuse for not remembering things anymore. I'm glad you liked it! Two words: OH YUM! This looks delcious and we love anything Buffalo Chicken. 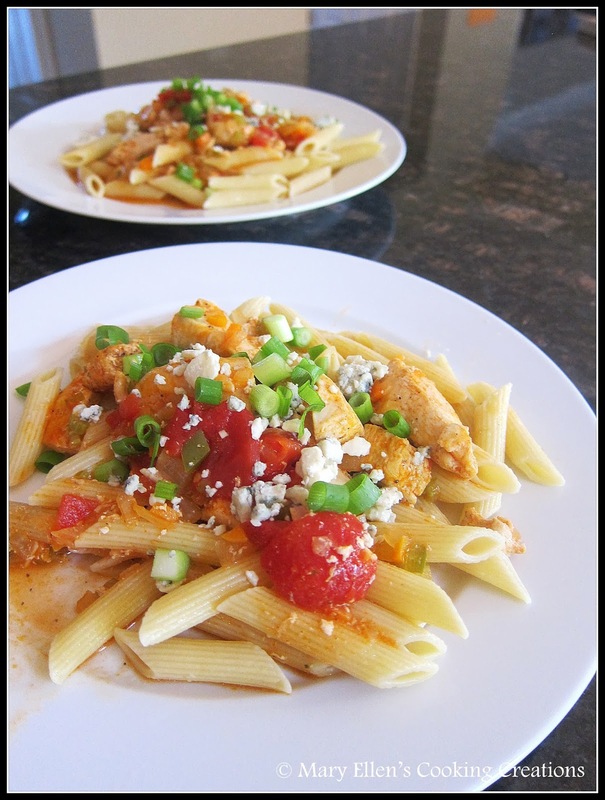 yummy,really this buffalo Chicken Pasta Recipes are so delicious.or its recipes method is so easy and its good for health,thanks.